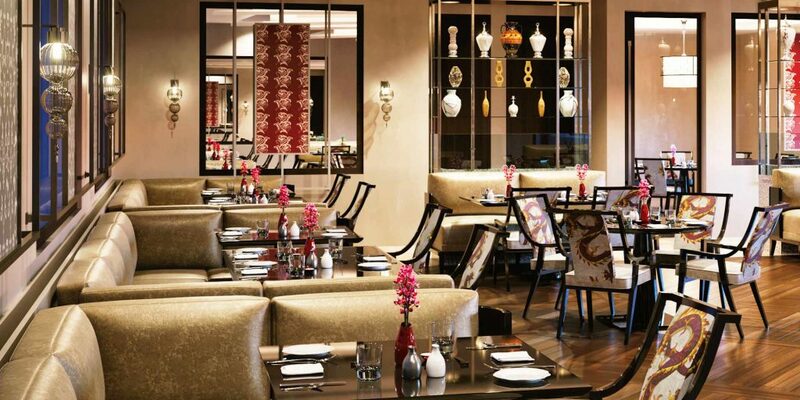 The Oberoi New Delhi gets a $100 MILLION make-over! 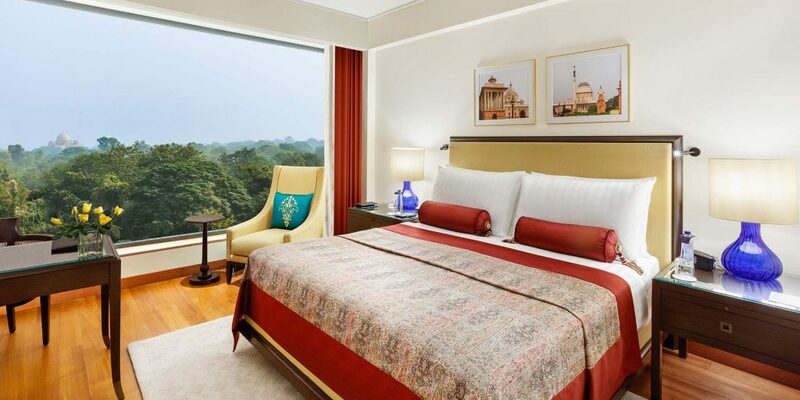 The Oberoi New Delhi is an icon for India’s capital city and has a deep-rooted, lively history. Now, it combines all that with a fresh and modern style after an extensive two-year makeover. 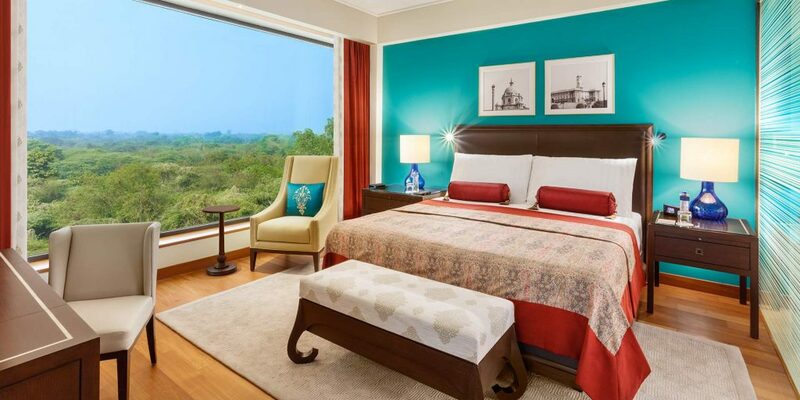 Larger rooms, clean-air technology, and the Oberoi’s signature service make this Indian Excursions’ favourite place to stay in India’s capital city. It’s not just us though! The Oberoi New Delhi has long been loved by visitors and locals alike since its conception in 1965, by the late Mohan Singh Oberoi. Throughout this time, the Oberoi has been raising the bar for luxury hotels in Delhi, in India, and arguably the world (the Oberoi hotels were collectively voted as the Best Hotel Group in the World by readers of Travel+Leisure magazine in both 2015 and 2016). The Oberoi New Delhi was the capital’s first privately owned luxury hotel, its first to employee female staff, and its first to offer 24-hour room service. 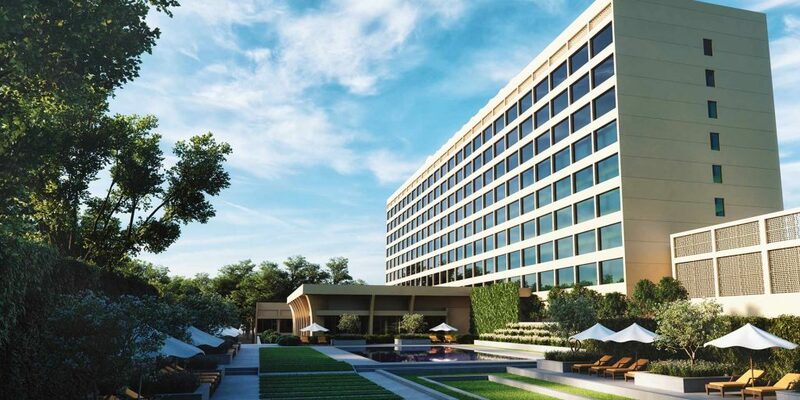 Following an extensive two-year, $100 million renovation and having reopened its doors in January 2018, the Oberoi New Delhi continues to stride ahead with a number of innovative concepts, such as state-of-the-art ‘Clean Air’ technology, ensuring guests are treated to the purest of air, on par with global standards. Further, all rooms are equipped with Oberoi E’nhance – an iPad wherein you can control lighting, check your bill, or order room service. The redesign, headed by Indian interior designer Vinod Goswami, is much inspired by the Lutyens’ New Delhi – an area of the capital named after British architect Edwin Lutyens (1869 – 1944) who was responsible for much of the architectural design and building during the heyday of the British Raj. The Oberoi New Delhi retains a number of Indian twists though, from traditional silk panelling to contemporary Indian art, to the original Tree of Life carving that’s been an icon of the hotel since it opened in the 60’s. Mr Rahul Parasher, Sales Manager of The Oberoi New Delhi, who showed our Co-Founder, Madeleine Hann, around the revamped property, explained that whilst practically the entire hotel had been gutted and rebuilt, the Tree of Life remained exactly where it had always been and that the new and improved lobby had been built around this. The gracious lobby. In the background, you can see the iconic Tree of Life wood carving that’s been here since the hotel first opened in the 60’s. We begin our tour in the impressive lobby. 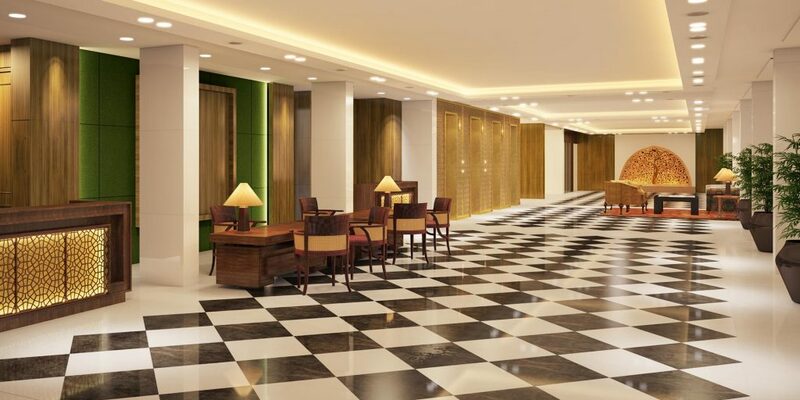 It’s refreshingly light and airy as compared to many of the thickly-carpeted, dimly-lit reception areas we’ve seen at other hotels in New Delhi. 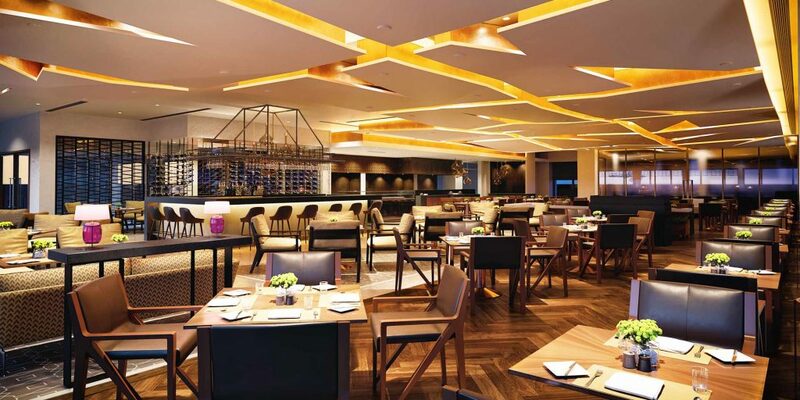 Here, on the lobby level, you’ll also find the much-loved threesixty° restaurant; The Oberoi New Delhi’s all day, multi-cuisine offering with something to suit all palettes, from European to Japanese, Italian to Thai, and – of course – Indian. A short walk away you’ll find the threesixty° bar; serving the usual tipples as well as more innovative cocktails and housing a temperature controlled wine cellar. Nearby, you’ll find another of The Oberoi New Delhi’s in-house eateries; Omya, an authentic Indian speciality restaurant under the hands of internationally acclaimed, London-based chef Alfred Prasad. threesixty° is the all-day, multi-cuisine restaurant. It’s here that you’ll be served breakfast. 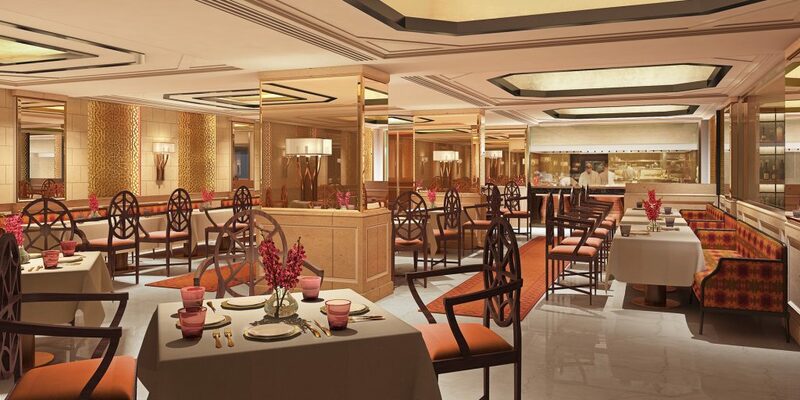 The Oberoi New Delhi also offer Baoshuan; an authentic Chinese restaurant serving innovative Chinese cuisine under the guidance of Michelin starred chef, Andrew Wong. 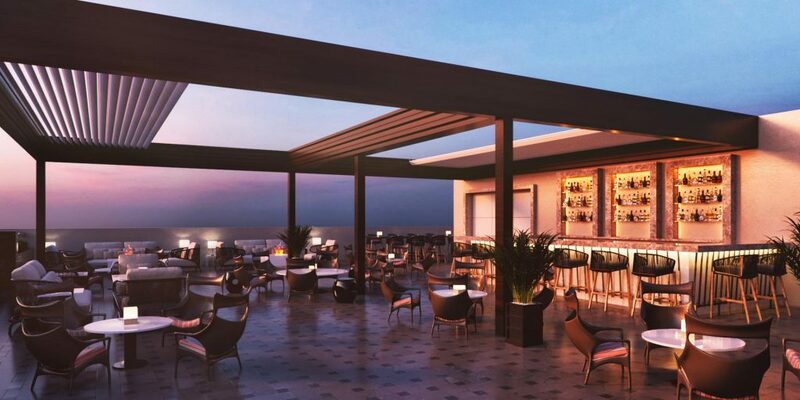 Cirrus9, the rooftop bar, offers sweeping views of the city, accompanied by cocktails, a delicious bar menu, and specially curated music. Lastly, step downstairs to the lower ground level and you’ll be immediately hit with the delicious aroma of cakes and pastries, freshly prepared in-house at The Oberoi Patisserie & Delicatessen. 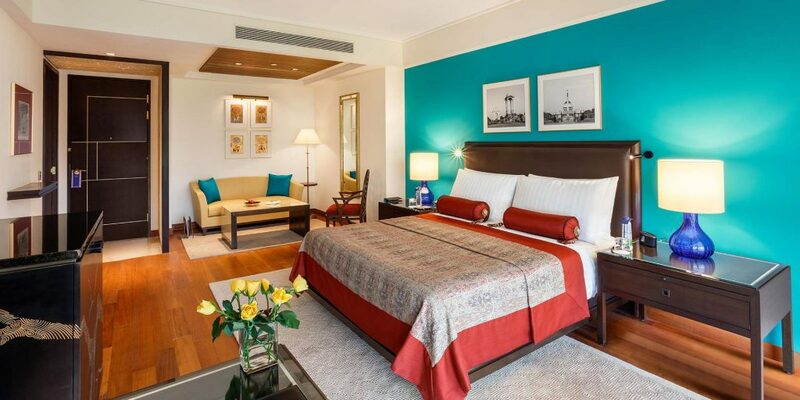 The recent revamp has seen The Oberoi New Delhi reduce their number of rooms and suites from 283 to 220, resulting in incredibly spacious lodgings which are rare when compared with the box-sized rooms of many hotels in the capital. 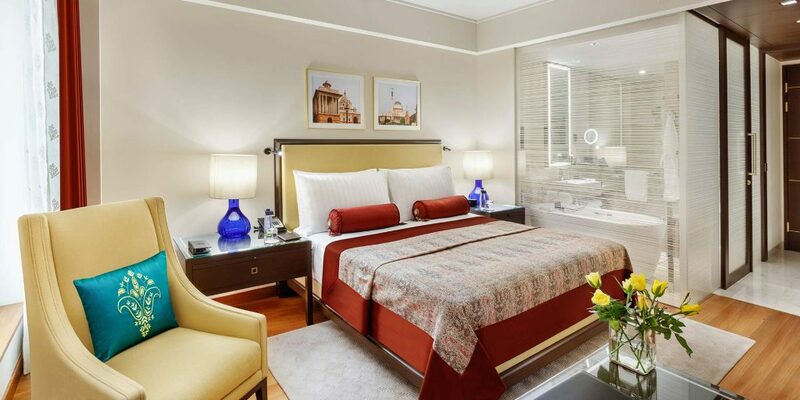 Of their 220 rooms, these are divided into eight categories, starting with the Deluxe Room, the Luxury Room, the Premier Room, the Premier Plus Room, the Oberoi Suite, the Deluxe Suite, the Luxury Suite, and – finally – the jewel in The Oberoi New Delhi’s crown – the Kohinoor Suite. The entry-level Luxury Room is identical to the next category, the Deluxe Room, with the exception of the Deluxe Room being on a higher floor and therefore offering more of a view. They’re a spacious 350 sq ft (32.5 sq mt), offer a king-sized bed or two separate twins, and are tastefully adorned. Guests can expect teak-wood flooring, white Italian marble bathroom fixtures, a bathtub and separate multi-pressure shower, fluffy white bathrobes and lovely Forrest Essentials amenities. What immediately hits you as you enter the stunning room, however, is the fresh pops of jewel-toned colour; sapphire-blue, ruby-red, and a soft citrine-yellow. The Premier Room features many of the same touches, upholstery and décor as the Luxury Room and Deluxe Room, though is larger in size at 550 sq ft (55.5 sq mt) and offers a sitting area. The difference between the Premier Room and the Premier Plus Room is that the latter includes complimentary access to the Resident’s Lounge, offering tea, coffee and snacks as well as beers, wines and spirits. 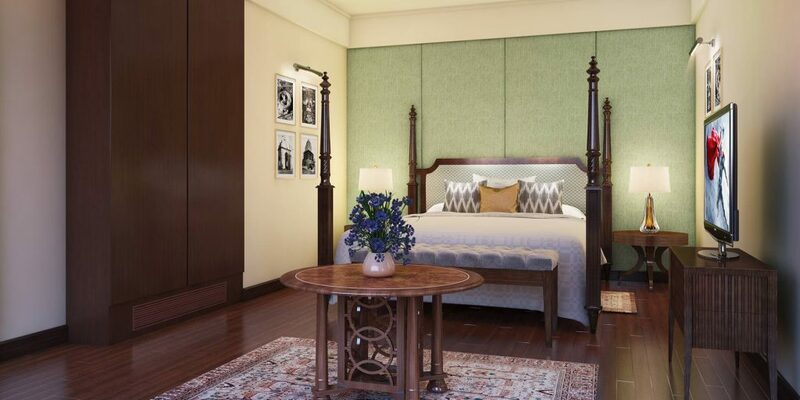 The Oberoi Suite comes in next at a spacious 725 sq ft (73 sq mt) and encompasses a grand master bedroom, a separate living room, and the option to interconnect with a Premier Room (ideal for families travelling with small children). The Deluxe Suite is more spacious still, at a whopping 1400 sq ft (141 sq mt). It boasts a living area with a powder room, a pantry, a king-size bed and an Italian marble bathroom. From the private balcony, you can take in a sweeping view of Delhi Golf Course or Humayun’s Tomb, a UNESCO World Heritage Site. The Luxury Suite takes all of the Deluxe Suite but raises you a private dining room and a huge 1800 sq ft of space (182 sq mt). Last but certainly not least, the presidential Kohinoor Suite is an enormous 3500 sq ft (353 sq mt) and exemplifies luxury. Unashamedly opulent, the suite has previously hosted Nicolas Sarkozy, Giorgio Armani, Queen Mathilde of Belgium and the Dalai Lama. The master bedroom boasts its own private sitting area and a private study, followed by a therapy room, a personal gym, and an unmatched view of New Delhi. 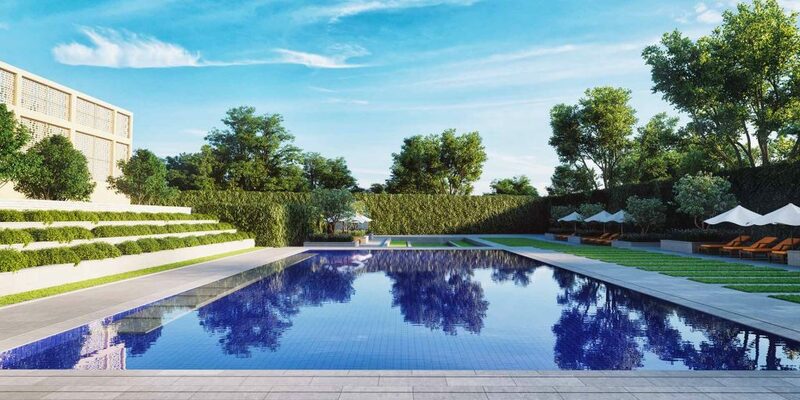 Whilst you’re not luxuriating in your room, enjoying a G&T on the rooftop or savouring a gourmet meal, guests at The Oberoi New Delhi are also treated to two swimming pools (one’s outdoor, the other is indoor), an infra-red sauna, and a serene, Zen-like spa with a menu offering traditional Ayurveda, Aromatherapy, Eastern, Western, and signature Oberoi treatments and massages. All in all, The Oberoi New Delhi is a fabulous place to kick-start your private, tailor-made tour of the region. Being located in the heart of the capital, you’re within easy reach of the sights of both Old and New Delhi, as well as the cities key shopping areas. You’re not too far from the airport, either, at just a thirty-minute drive. If you’d like to include a stay at The Oberoi New Delhi on your upcoming holiday to India, please do get in touch. We’re well equipped to create a truly personalised itinerary based on your ideas, schedule and budget, and, being a Preferred Partner of the Oberoi Group, have exclusive access to special offers and complimentary upgrades. For further inspiration, why not take a quick look at our insider’s guide to Oberoi hotels in India? To extend your Oberoi experience beyond New Delhi, we’d recommend this luxury Rajasthan tour with Oberoi hotels; it takes you from New Delhi to Agra to visit the Taj Mahal, on to Ranthambhore to spot wild Bengal tigers in the jungle, then to the Pink City of Jaipur, and, lastly, the romantic lake-side city of Udaipur.